When he’s not working for the zombie outbreak response team, Grady Hull is assistant brewmaster at New Belgium Brewing. Here, he proudly displays the company’s unique dry hop dosing skid. 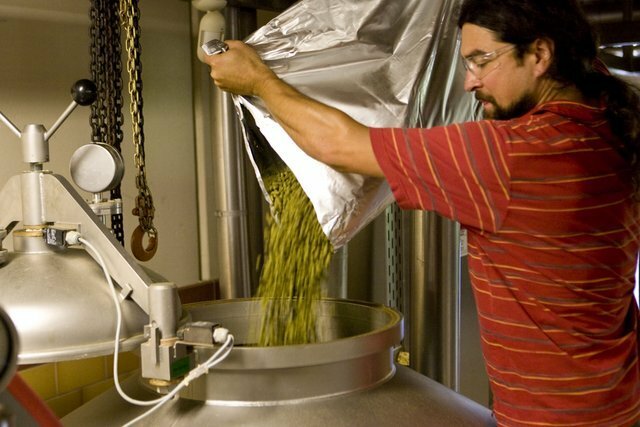 Delivering high levels of fresh hop flavor and hop aroma have become calling cards for U.S. craft brewers. While German beer makers were the first brewers to start using wild hops in the early 8th century, it’s been American innovators who have taken both hop production and hop-infused beers to new levels of innovation and flavor. Rewind to 1909 and marvel at the mechanical hops separator, patented by Emil Horst in Elk Grove, Calif. (ok, he did emigrate from Germany). Emil Clemens Horst had, at one time, the largest number of acres under hop cultivation in the world. He revolutionized hop growing and processing with his patented mechanical separator that harvested the hops while discarding the vines and leaves. Since the 1930s, Oregon State University (OSU) has been a global hot spot for hop research in North America. The U.S. government, OSU and some very talented minds have literally generated millions of acres of research on hop varieties, producing engineering icons like Dr. Al Haunold (who is credited with some 20 varieties of hops, including Cascade, which is a cornerstone in today’s craft brewing industry). Today, American craft brewing pioneers have taken up the torch for innovative hop usage. A forward-hops taste (and the IPA category of beer) is almost a hallmark of U.S. craft beers, but how exactly do brewhouses produce those unique hoppy flavors? Well, many times creative brewers construct one-of-a-kind machines and vessels to capture the aroma and taste of hops like never before. Colorado’s New Belgium Brewing Co. is one such innovator. 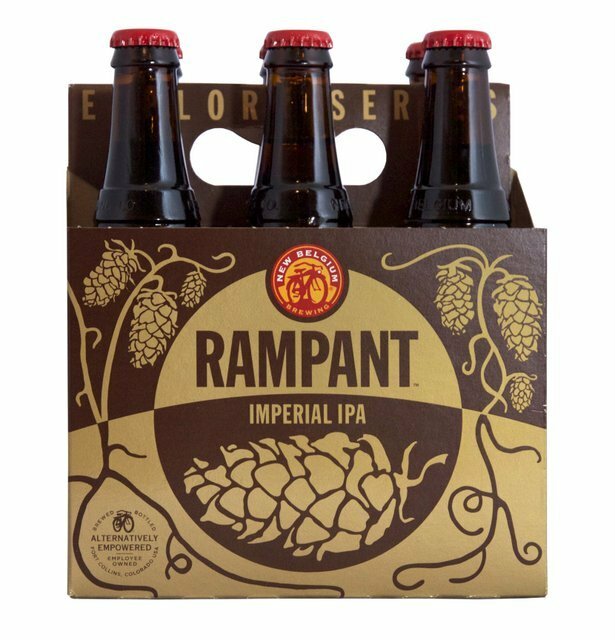 A burly and bitter imperial IPA, Rampant is one of the intensely hoppy New Belgium beers that uses the dry hop dosing skid to saturate the brew with Mosaic, Calypso and Centennial hops. New Belgium’s dry hop dosing skid has been inducted into CBB’s new series — Innovative Hopping Equipment — our little hall of fame for hopping equipment, techniques and production. Here’s a breakdown of the mechanics and theories behind New Belgium’s innovative hopping gizmo and other unique hop insights from this famous Fort Collins brewery. Under a CO2 environment, beer is drawn into the dry hop dosing skid from the transfer pipe. Hops are then added by hand to the beer in the skid to make a dry hop slurry. The slurry is then injected back into the transfer pipe on its way to the reaction vessel. This method of dry hopping maximizes the speed of hop aroma oil extraction so that the extraction is complete in the time it takes to do the two transfers (about 16 hours). This is how hops are added normally to New Belgium beers. Brewmaster Eric Salazar is seen hop dosing in Brewhouse 2 at New Belgium’s brewery in Fort Collins, Colo.
New Belgium Brewing uses the dry hop dosing skid for all of its dry hopped beers, including Hop Kitchen, Rampant, Ranger, Accumulation, Hoptober, 2 Below, Snow Day and Mighty Arrow. 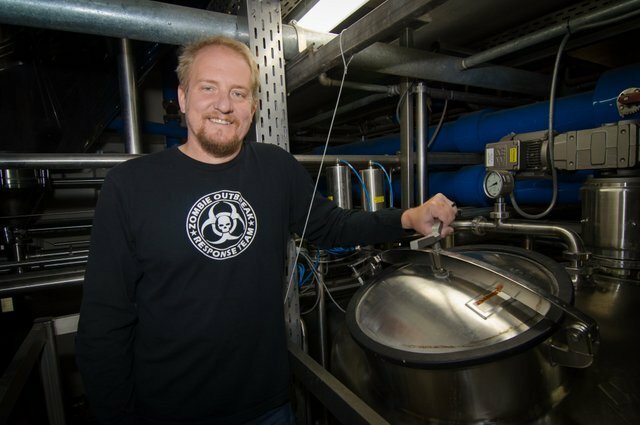 “We also use the dry hop dosing skid to add spices to beers like Pumpkick and Coconut Curry Hefeweizen,” said Hull. Christopher Ordas liked this on Facebook.